Treatment of carboxylic acids with amines in the presence of the dehydrating agent N,N’-dicyclohexylcarbodiimide (DCC) leads to the formation of amides. 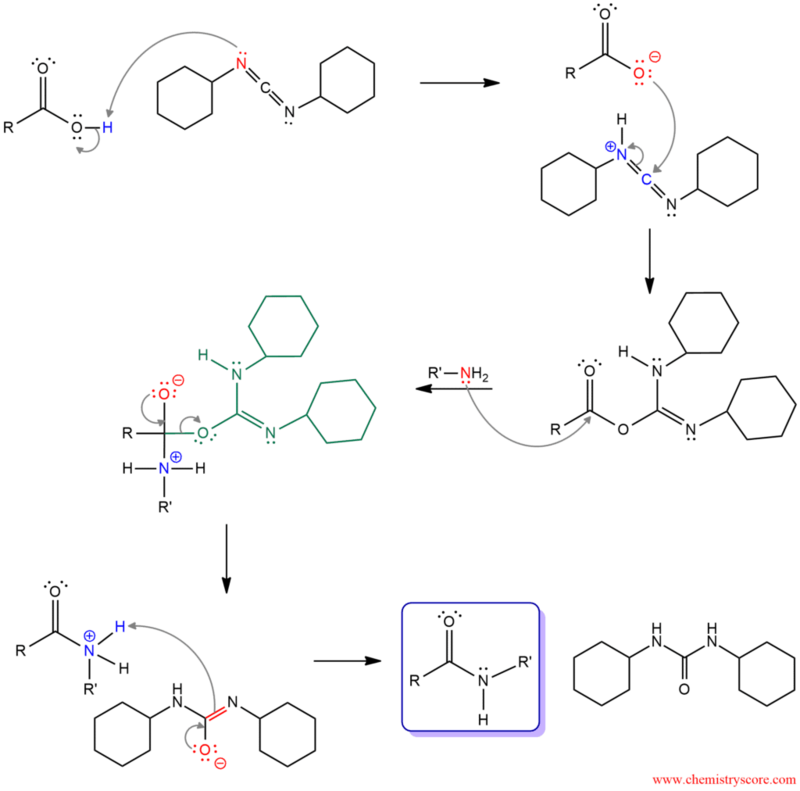 This is particularly useful for peptide synthesis. When treated carboxylic acid with ammonia (or amine) at room temperature, ammonia (or amine) will function as a base and simply deprotonated the carboxylic acid. By adding proton, ammonium salt would be obtained. Heating the ammonium salt, the desired amide sometimes would be obtained. This is not the best way to make an amide. A much better way would be to use N,N’-dicyclohexylcarbodiimide abbreviated DCC. This compound allows amine to function as a nucleophile and form the desired amide. In the first step of the mechanism, a lone pair of nitrogen attacks OH group and deprotonated carboxylic acid to form carboxylate. Protonated DCC is now a good electrophile. The carboxylate attacks electrophilic carbon between two double bonds moving one of them up onto the nitrogen. In the next step, the amine is a nucleophile and attacks carbonyl carbon, breaking the π bond form a tetrahedral intermediate with a negative charge on the carbonyl oxygen. When this carbonyl group is reformed, a leaving group is expelled. A leaving group, now, function as a base and deprotonated amine to remove the positive charge and get final amine.